Black women have been poorly represented in the mainstream. So a new yearlong fellowship prepares women to redefine the stories that are being told and control who gets to tell them. The wrenching image of a Black mother clinging to her 1-year-old son as police officers and security guards at a public benefits office in Brooklyn ripped him from her arms went viral recently. Child endangerment and resisting arrest charges against the 23-year-old Brooklyn mom were later dropped. Now, Jazmine Headley is speaking out. “The surface” Headley is referring to is mainstream media. The charges against her were dropped and she received the help she needed because her story gained national attention. It’s incidents like this one and women like Headley—single Black mothers in need of support—that inspired a new yearlong program called the Black Mamas Storytelling Fellowship. Created by Channel Black, an Oakland, California-based nonprofit, the program is intended to help Black mothers develop and share stories from their own experiences. Organizers Shanelle Matthews and Mia Birdsong wanted to develop a curriculum that not only helps Black women locate themselves inside this political moment but also drive change for Black people—and in particular, for Black women. Black women, Matthews says, have long been talked about, for example, in stories about the so-called “welfare queen”—a label coined by former President Ronald Reagan that demonized low-income Black mothers—or in ones that imply or outright blame single Black mothers as the reason for the plight of Black families, including their own children’s death at the hands of police and community violence. The time has come, she says, to redefine the stories that are being told and control who gets to tell them. Black Mamas Storytelling is preparing women to do both. 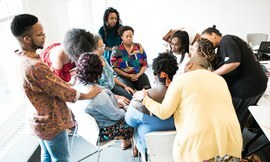 Seven Black mothers from the Oakland area who participated in the 2018 fellowship helped team leaders decide what their particular group would focus on for the year. Four program components resulted: the Pedagogy of Black Women, Political Education, Self-Transformation, and Media. Fellows listen as team members go over the morning agenda and goals review section. Photo by Sasha Matthews/Green Tangerine Photography. The group meets in person once a quarter throughout the year for daylong sessions where the fellows are provided meals, child care, and a stipend. Between meetings, they receive one-on-one coaching from communication strategists. While each training session varies, the women typically practice exercises that connect what they learn from the four components of the curriculum to on-camera work with playback and feedback. The goal is to prepare them for their capstone projects, where they develop a speech or panel discussion. The fellows may also write an article on a topic they’ve chosen, which could be their field of work or related to their day-to-day lives. Because of the cultural and racial disconnect, Black and Brown people are suffering. Kai Shateen is one of the inaugural fellows. At 39, she started midwifery school after beginning the fellowship. An advocate for reproductive justice, she says the program has given her the language to talk to her clients and their families, as well as health care providers about the reproductive issues that affect Black women and mothers. Because of the cultural and racial disconnect, Black and Brown people are suffering, Shateen says. Some other fellows, including Jasmine Hardison, have focused on criminal justice and community violence. In 2016, Hardison’s son, David, was gunned down in the streets of Oakland—two weeks after his 21st birthday. Jasmine Hardison, left, sharing her thoughts during the session as Kai Shateen, right, listens. Photo by Sasha Matthews/Green Tangerine Photography. She believes being open about her son could help other mothers whose children are straying or have gone astray. “I also get backlash because people are like, ‘Well, he was in a gang so that’s pretty much a sure way to die.’ And, ‘why are you telling his story; he wasn’t a saint,’ almost like he deserved to die because he was in a gang,” she says. Responses like those are what led Hardison to apply for the fellowship in early 2017, just as she was starting to get involved in community work. While she says she has benefited from each segment of the fellowship, Pedagogy of Black Women resonated with her the most. So far, it has helped her tell her story differently—without guilt and stereotyping herself, or criminalizing her son, she says. At community meetings, or one-on-one conversations with mothers who share her misfortune, she talks about the mistakes her son made as well as those she made as a parent. But she also aims to give them hope through her storytelling. Hardison admits she had some hard times with her son, whom she had when she was just 16. He was her only child, and mother and son practically “grew up together,” she says. She dropped out of school, had been sexually abused, and was homeless for a period of time—living with friends and relatives. To reach young people facing many of the same challenges her son did, Hardison founded a nonprofit in 2017 for middle school children. It’s called King David Respect for Life Inc. and focuses on children at the age when they are more easily influenced by friends and peers and what’s going on around them. “To be there to give support, tell my son’s story, and provide resources,” is what she wants to do through her organization, she says. Hardison says she wants to do for young people what the Black Mamas Storytelling Fellowship did for her and the other women—give them the tools and resources to own, frame and tell their own stories. It’s experiences like Headley’s in New York, and Hardison’s and Shateen’s that create the need for a Black Mamas Fellowship program. A child care worker reads to one of the children attending the provided child care class. Photo by Sasha Matthews/Green Tangerine Photography. Storytelling and ethical narrative framing are important, says Mia Birdsong, co-director of Channel Black. And they determine who matters, whose valued and invested in—figuratively and literally. People don’t want to invest in Black women, says Birdsong. She posits that if there is no change in how Black women are valued, our social and political conditions—overall—won’t change.